Short synopsis: Mirza is a middle-aged Indian college professor whose wife has left him. He moves out of his house into a tent in his back garden, where he sets up an outdoor classroom and serves tea to his kind but bewildered neighbors. He is visited by the irritable spirit of his long-dead teacher, Khan Sahib, who is befuddled by the dysfunctions of modern life. In the north of England, Mirza's niece, Amal, is finishing up her last year of college before she is expected to join her parents in their new home in India. Asked by her father to talk her uncle back into his senses, she moves into Mirza's house, and they soon are connected by their shared loneliness. She meets Rehan, Mirza's student, and is intrigued by the path of certainty he has built over his own loss and loneliness—a certainty that is threatened by his growing feelings for her. When Rehan disappears, Amal's suffering forces Mirza to face the world once more. Together, Mirza and Amal must come to a new understanding of what it means to be an immigrant family when the old traditions have unraveled. 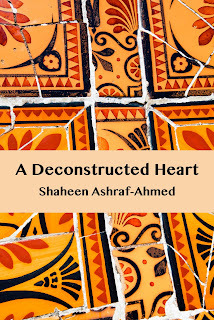 A Deconstructed Heart is a novella that explores the breakdown and rebuilding in one immigrant family trying to adapt: how lines in families and cultures are forcibly redrawn, how empty space can be reframed by a tent into a new definition of home... but how, no matter how hard we may try to forget, the past refuses to be contained. Why I wrote this book: Mirza's story came tripping from me the first moment I sat down to write. I have always been interested in how immigrant families adjust to life in a different country; the push-pull of assimilation vs. the retention of tradition is a fascinating dynamic. Too often, this theme is explored in a stereotypical way, by focusing on a female character caught between the expectations of her unyielding parents and a taboo love interest. I consciously steered away from that. I thought that it would be more interesting to explore the disintegration of family and community social structures for an immigrant family and how that sets the characters adrift. The main protagonist is a middle-aged man, but this is a midlife crisis with a difference: Mirza has to reconcile his past, present and future as an immigrant with an entire support system that is falling apart. His wife has left him and he has no tight-knit family to help hold him together. He has to start from scratch, building a new community for himself. Reader's reactions: I have been very happy to see that A Deconstructed Heart has some wonderful reviews, and that some of these are from readers of Indian heritage. That lets me know that I'm getting something right! I released my book and A Change in the Weather at the end of October 2012, and The Dust Beneath Her Feet was published in December, so it has been a hectic couple of months for me. I look forward to hearing back from readers; they always have a fresh insight into my stories. From Amazon.com: "The "deconstructed heart" of the title concerns the disconnection between a husband and wife, but could also be a stand-in or metaphor for the disconnection within a family separated from loved ones in a former homeland, or between old and new cultures. The author has a fine sense of style, with a wry sense of humor, rich images, and skillful use of simile and metaphor. Writing this good is rare." 5 stars. O. Barnack. Behind the scenes: The original title of this book was going to be 'The Breakdown', but I got to thinking about the 'deconstruction' theory of language or how, within a single word, there is an interplay of different meanings going on. I was thinking about the slipperiness of meaning, and how unstable life inherently is: how we think we know someone but really don't, like Mirza's relationship with his wife; how an immigrant, even a second- or third-generation child of immigrants, often has to inhabit multiple identities; how even the concept of 'home' and 'family' can mean different things to different people. I liked the idea of exploring instability, because there is movement there: something is about to change or surprise us. Some of the characters in my book are uncomfortable with not knowing what will happen next, however, and gravitate towards absolutes in their lives. I'll leave the reader to discover who that might be… and I'll award an A+ to anyone who can find the name of the philosopher who invented deconstruction theory, where I casually dropped it in my book. You go to the head of the class!